Day 2’s keynote speaker outlined the challenging strategic context in which NATO was seeking to transform itself in order to maintain and bolster both its effectiveness and its relevance. In reminding the audience of the key ingredients of an effective deterrence strategy, it was highlighted that the Alliance needs the military capabilities to respond quickly, coherently and in strength if it is to successfully deter across a range of contingencies. Air power’s unique attributes of height, speed, reach and agility allow it to play a decisive role in such a strategy. To remain one step ahead of potential adversaries, NATO still has much to do if it is to maximize its deterrent effect. The delivery of the system has been challenging, not least in time and cost. 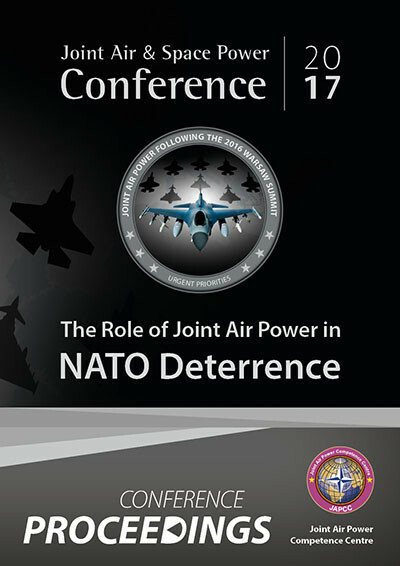 Specifically, the Air contribution to Allied ISR must be enhanced; Allied missile defence assets must be merged and their operational cohesion and effectiveness enhanced; the Air domain must be brought to bear imaginatively to counter hybrid threats; NATO must be prepared to neuter layered ISR and to defeat increasingly sophisticated potential adversary A2AD systems; NATO must sustain the ability to provide crucial close air support to Land forces; and partner air forces must better integrate cross-generational air capabilities. NATO has come a long way but there remains much to do. Recent improvements in training and exercising matter a great deal but we need to move forward with a campaign of Joint experimentation and to take lessons from real-world examples such as enhanced Forward Presence. In some areas a mindset change is required; we must all strive to continually improve our preparedness, to be ready to any eventuality.